Two years later, I'm still driving the 2013 Nissan Frontier. It's really not bad - reliable and pretty easy to drive. I wish it got better fuel economy for its size, but it is peppy enough to be fun. It was the obvious choice over the Tacoma, but newer full-sized offerings from the big 3 are compelling in terms of value and performance. 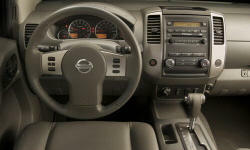 Why the 2013 Nissan Frontier? I compare this truck frequently to its obvous competitor - the Toyota Tacoma. I liked the interior of the Frontier a lot more. It's spartan, but it doesn't feel cheap like the Tacoma did. The seats are a durable feeling cloth, the interior surfaces are plastic, but they did a good job of making it feel like a truck and not a toy, if you get my meaning. It's no BMW for sure, but generally I was pleased with the fit and finish. Now and then I do hear a little rattle/squeak from the dash, but that's probably my fault (see audio/nav in Cons for more). It drivessignificantly better than a similarly-equipped and aged Tacoma. You sit up high (as you'd expect in a pickup) but it handles more like a car than the Tacoma or the F-150, Ram 1500 and GM 1500s I tried. The ride is quiet and smooth - the 2WD chassis handles bumps very well without a lot of drama. No bouncing the rear axle around, no teeth-rattling bounces from the front. The steering is tight. By that, I mean it is precise, but also it requires more effort to turn the wheel than our Corolla. I realize it's not a 1:1 comparison, but every time I take the Corolla to work I think, "Wow, this car is much easier to steer!" I am very pleased with the power the VQ40DE makes. It was much faster than the normally-aspirated F150 V6 and the GM 4.3L V6, and similar to the Tacoma. In fact, it felt like it had just as much pep as the 5.0L in the F150. This is likely because of the weight difference. It only has a 5-speed automatic, whereas other similarly-aged trucks seem to be coming with 6 to 8-speed automatic transmissions. It cost $7,000 less than the nearest equivalent Tacoma. The driver's seat feels nice and comfy, even after two or three hours of driving. Not too much pressure under the legs by the knees, and not too little lumbar support. I imagine the passenger's seat is the same, but I so infrequently sit there I can't really comment. 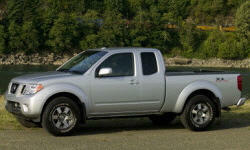 Why Not the 2013 Nissan Frontier? I keep a detailed log of fuel economy. I commute on hour each way, every day. 50% of the time is spent at 65 mph on the highway, and the remainder between 50 and 60 on 2-lane country roads. Only a few stops in between. Very consistently getting 21.5 to 22.3 mpg. I rarely rev it above 4000 RPM - only when passing someone. That happens maybe once or twice per tank. I am underwhelmed by the fuel economy. Full-sized trucks with larger, stronger V8s get similar economy. I had the second-best stereo option. It has the larger LCD screen, two speakers per side up front (a 6x9" in the front door near your feet, and a 3" mid-tweet in the corners of the dash pointed straight up at the windshield). Rear has oddball 6.5+" speakers in the doors. It was the only thing I knew I'd be replacing as soon as I bought the truck. The sound quality was laughable. I bought aftermarket 6.5" components, fabricated brackets to mount them in the front OEM locations, and used a level converter and aftermarket amplifier to drive the front speakers. Easily twice as good as factory, and it looks stock. I hid the amp under the front passenger seat, but either front seat has ample room. Keeping in mind that I've got OEM tires with 45,000 miles on them AND only 2WD, but the performance in snow is laughable. Yes, it has some pseudo-limited slip using the wheel speed sensors and ABS actuators, but it's not the same as a real mechanical locking axle and certainly not even close to 4WD. It did slightly better in some slick clay-based mud, but I wouldn't call it a good off-roading vehicle. However, in the South, the two or three days per year I wish I had 4WD are the days that are better spent staying home anyway. I much prefer the handling, maintenance, and economy of the 2WD. The factory tires are a little noiser than I'd like on the highway. Also, they don't seem to have great traction in mud or snow, but this seems to be how it goes with OEM tires, in my experience. Once they wear out, I'll be picking something different. They do seem to be wearing well - still have some tread at 45,000 miles. I'd say it's good enough. I do like the exterior styling of the Tacoma a bit more, but since I'm looking at the inside most of the time, I decided I didn't care. Good news- you can fit a standard 40" x 48" pallet in the bed, and it sits flat! We filled the entire bed with flat-pack furniture from IKEA and drove 3 hours home. It handled it just fine. Interior storage space is at a premium. The rear seat does have some containers, and I keep some tie-down straps and the jumper cables back there. The center console bucket, between the front seats, is fairly large. The glove compartment is small - just enough room for the owner's manual folder, plus a medium-sized flashlight. There's an upper glovebox as well, and it can fit a few CD cases and some sunglasses. There's a small cubby in the dashboard, below the HVAC controls. I keep my work badge in there. There's a sunglasses compartment in the headliner, next to the lights. I can fit two pair up there if they're not in cases. Not a ton of space, but probably sufficient for most needs.